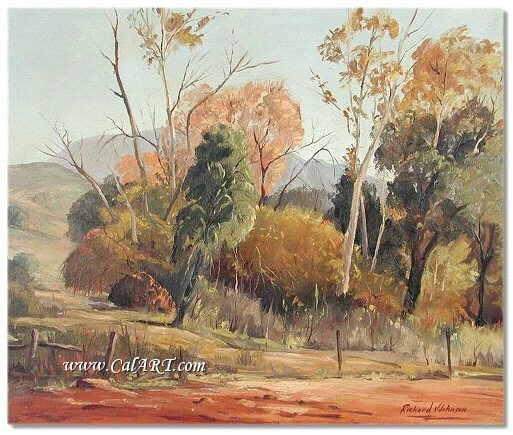 Watercolorist, Landscape Painter, was born in Glenwood, MN. & moved to Long Beach, CA in 1920 with his family. His art studies included courses from Chouinards in Los Angeles, Crafton Hills College Seminars in Redlands California, Nicholai Fechin with Jepson Art School of Los Angeles, Sam Hyde Harris and watercolor studies with Rex Brandt, Millard Sheets, Robert E. Woods, George Post, Barse Miller and Milford Zornes. Johnson’s art career, interrupted for service with the Air Corps in World War II, included illustration in Los Angeles and New York and specialization in outdoor advertising. His love for the outdoors & nature is most evident in his many landscape & coastal paintings of California, Oregon & Hawaii. He also painted many scenes during trips to Japan, China, Vietnam, the South Pacific, Europe, and Scandinavia. He earned a lifetime teaching credential in Oil and Watercolor from the state of California, resulting from 25 years of teaching at Orange Coast College and Coastline Community College of Costa Mesa and was on the founding faculty of the CCCD. Exhibitions included the American Watercolor Society, Grumbacher Traveling Exhibit, awards in shows with the Los Angeles Home Show, Laguna Beach AA, Traditional Artists Guild, Seal Beach Art League. He was a member of the American Watercolor Society; AAPL, Long Beach Spectrum Club, Laguna Beach AA, Traditional Artists Guild of Paramount, San Gabriel AA and the Desert Art Center of Palm Springs. He is listed in AskART.com, Hughes, Who's & Davenports.